How many times did you get a file that was impossible to edit? Those files can be either in an image or a PDF format. Business and legal documents, school papers and other types of everyday documents, they are usually all saved in a PDF format. Why do people keep the documents in PDF? The PDF format is not easy to change, and it can be viewed on different devices and operating systems. So when you want to receive or send a document to someone, PDF is the right format to choose. You don’t need to worry whether a document will look like as it should. In addition to that, PDF files can be secured with a password so that you can transfer such files safely. Native vs. Scanned PDF Files - What is the difference? Native PDF files are those documents you create on a computer. For example, you are working on a Word document, and you save a Word document as a PDF. That is a native PDF file, and it is effortless to convert it back to Word or another editable format. Upon conversion, such files are back to their native state and ready for editing. On the other hand, scanned PDF files can be a nightmare. Such files were a paper document that was scanned with a scanner and transferred to a computer. With paperless trend and the fact that businesses and individuals are relying on computers more than ever, it has become a normal thing to store all paper documents digitally. In that way, you can have everything on your computer and color of the letters won’t fade away. What is the problem with scanned PDFs? Scanned PDF files are hard to edit, they require a unique program with integrated OCR technology. OCR stands for optical character recognition- in other words, programs and tools with such technology can extract data from a scanned file. So, when you want to edit a scanned PDF file and try to convert it to Word with a regular PDF tool, you will get a Word version of a scanned paper. You won’t be able to edit it because it will remain what it is- an image. There is a way to edit scanned PDFs- by using PDF converters with OCR technology. There are several such programs on the market, some of them are for desktop, others for mobile, but there are also such tools that work online. Here we will show you how to convert a scanned PDF to Word with one such tool and get a file that will be unlocked for editing. When you visit this PDF tool, you will spot the Choose File button. Click on it and locate a PDF file on your computer. Select a PDF and click on Open. The second step is to enter the email address where you want to receive the converted file. Lastly, click the Start button and conversion will begin. The conversion speed depends on the file size, but it usually takes a few moments to receive a file. When you receive an email, you will find the link at the bottom where your file is waiting. The link will lead you to the page where you will just need to click on the Download your file button to download the .docx file to your computer. Open a .docx file with MS Word or any other alternative tool and start editing it. As you can see, there is a way to save time and not retype scanned files. 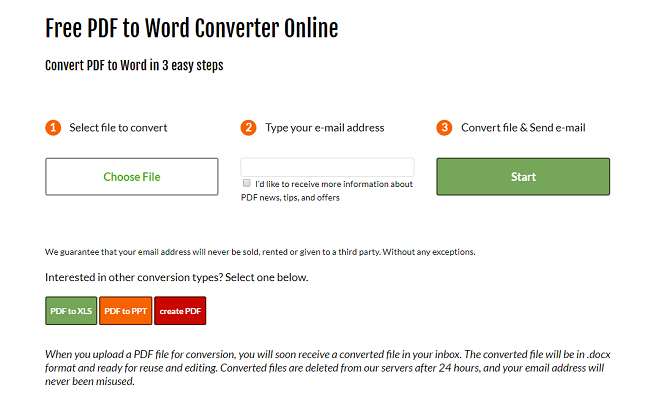 Instead, you can convert them to Word with a PDF to Word converter and have an editable version of your scanned PDF.